Our lives are busy, super busy, waaaaay beyond healthy busy. Our nervous systems are designed to cope with short sharp spikes of stress and adrenalin, with lovely, long periods of rest and recovery between. Nowadays the opposite is true - we live at a medium-to-high level of stress almost constantly, with very few, and very brief periods of rest and recovery. Our systems are depleted, our minds are overwelmed and our bodies are exhausted. The Nourish and Flourish Retreat is a chance to re-set and re-learn. It is not just about taking a rest from work, but about entering a space where you are guided by experts into deep relaxation, new perspectives and gain new tools to help you instill greater balance in your daily life beyond the retreat. In this space of connection with nature, the innate wisdom of our bodies allows us to regenerate and recover. We can then cope more effectively with what lies ahead. In particular the water element invites us to release tension we didn’t even know we were holding, she mirrors the patterns of our minds and enables us to see deeply into our selves, our resistances, and the awe-inspiring potential that often lies dormant within us. 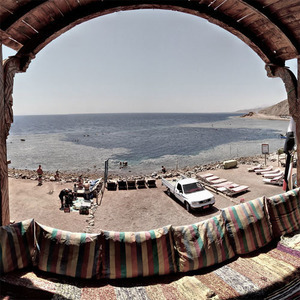 Join this exclusive retreat, hosted by former World Champion freediver, and yoga and meditation teacher Sara Campbell, along with her team of highly qualified coaches, at the stunning Le Meridien resort on the coast of the Red Sea. This is a retreat like no other. Using ancient traditions os self-awareness, body wisdom and deep relaxation, modern practices of physiotherapy and the infinite, gentle, yet uncompromising honesty of the ocean, our team is waiting to take you on a journey beyond the concepts of your mind, of what is possible, and deep into your potential for wellbeing and performance. Each member of the team is an expert in his or her field; Sara will teach you about the spiritual path of breathhold diving - and guide you on a journey to discover your own depths through her programme; Jeanphi has taught many disciplines of yoga for over 25 years and has now come to a place where relaxation and release of stress, tension and trauma are his guiding principles; Kati is an expert in gently guiding those with no experience of diving, including those with fear or water-related trauma, to take their first steps into the underwater world on one breath; and Bart is an exceptionally intuitive physiotherapist, who combines his science with a yoga practice and our water-based teachings.